Fall is a special time of year; a time where I can let my ‘basic’ freak flag fly. Don’t pretend like you don’t know what I mean. I digress. Fall is wonderful. This time of year means slowing down, turning indoors, and spending more (but not too much) time with family. Shorter days give us excuses to do things inside – like the cooking and crafting we neglected all Summer for fun in the sun. So in the spirit of Fall, I figured it was high time I spiced (no pun intended) up my living room. Summer has left this room neglected, barren and devoid of all effort. I’m OK with that. But now that I actually have to look at it more, I need to fix it. Cue easiest fix ever: Pillow covers. I have made dozens of these. I have a number of plain white down pillows that I keep swapping covers out on and they couldn’t be easier to customize. Plus, a yard and a half of fabric will get you 3 cases – so you’re literally only paying a couple bucks per pillow cover. Try finding that at Homegoods. Step 1: Wrap fabric around pillow to fit. 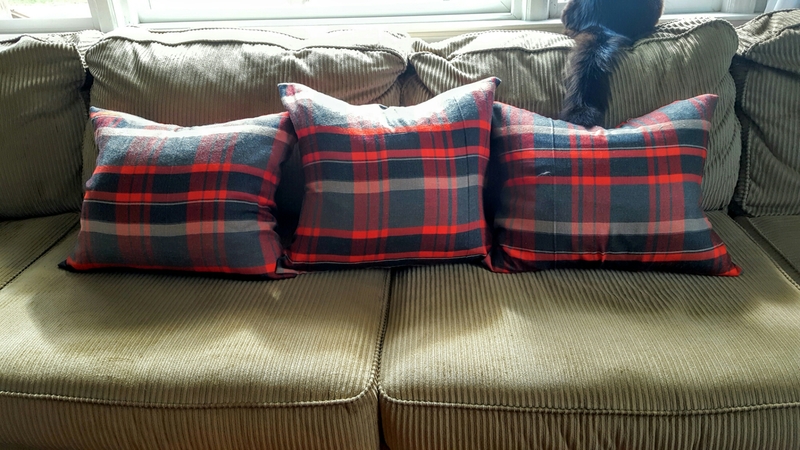 (alternately you can use an old pillow cover as a template) Make sure you leave enough fabric to overlap 3-5 inches. This will make sure your pillow stays tucked in. Cut your fabric. You will only need one long piece – that’s the beauty of this pillow cover. Step 2: Finish short ends of fabric with a roll seam. Essentially, fold edge over 1/4 inch, then fold in once more so that raw edge is tucked in and not exposed. This will prevent fraying. Sew with 1/4 inch seam allowance. Step 3: Wrap cover around pillow with wrong side out. Pin ends where you want them – I like mine a little snug. Slide pillow out. Step 4: Pin and sew two open ends closed (with pillow cover still inside out) with straight stitch. Then, serge stitch the edge. This will keep edges from fraying. Step 5: Turn pillow cover right side out and tuck pillow in. Done. Insta-decorating. Seriously easy and seriously cheap. For these I calculated about $5 per pillow cover. Not too shabby and so flipping cute. Annual 'welcome back' post for Barb! ⠀⠀⠀⠀⠀⠀⠀⠀⠀ Cleaned out the freezer of all the frozen rhubarb this week - rhubarb breakfast cake and rhubarb + meyer lemon syrup graced the kitchen. In no time we'll be desperately chopping Barb back because she grows like a weed. : : Any friends out there who love rhubarb? Maybe we can barter 😆. But seriously. The blogging community is full of inspiring projects and websites and we all enjoy helping one another by sharing. Therefore, if you would like use a photo or content from my blog, you are welcome to do so using a photo and brief description of the given project, along with link back to my blog. Under absolutely no circumstances should entire entries and tutorials with my personal photos be copied and pasted onto your blog. Nobody appreciates having their hard work and intellectual property stolen. All original content copyright craftybridge.com 2012 – 2018.